Although Thailand is rich in diplomatic and cultural assets, its operation of public diplomacy has been underexplored in academic circles. The Ministry of Foreign Affairs (MFA) enacted the 20-Year National Plan on Foreign Affairs (2018-2037). The plan underlines nine core strategies to enhance Thailand’s national image and international recognition such as branding Thailand, encouraging Thai people and public entities to be more proactive at international stages, publicizing the correct understanding of Thailand among foreign publics, etc. According to Thailand’s Area-based Strategic Plan 2018-2022, Africa is prioritized as the destination for trade, service and investment. This strategic plan also refers to partnerships for promoting the late King Bhumibol Adulyadej’s Sufficiency Economy Philosophy (SEP) and new sources for energy security as overriding schemes of constructive arrangements with African countries. This article aims to analyze Thailand’s public diplomacy activities in Mozambique through the lens of Guy J. Golan’s integrated public diplomacy. It focuses on three major elements: effective communication, brand/reputation dimension and relationship management. This approach is applicable to the case study as the framework covers Thailand’s main public diplomacy activities executed up until today, while leaving some spaces for conceptual development. The first component of integrated public diplomacy relates the framing of issues and agendas by a set of actors. This section examines the principal messages that Thai diplomats narrate in order to connect Africa and Mozambique to the general public of Thailand. “Africa is the region of the future. It has a plethora of potentials.” says Busaya Mathelin, MFA Permanent-Secretary, in the documentary filmed by The Cloud. “Thailand realizes its role to turn these prospects into reality,” she adds. In this documentary, the three Thai ambassadors also share their impressions of African commodities that can be traced back to the inception of global and regional civilizations. For example, the Thai Ambassador to Kenya introduced coffee, the most famous souvenir of Kenya. Furthermore, he mentioned that the term “coffee” stemmed from the name of a town in Ethiopia: Kaffa. For Thailand, Mozambique is essential as it attracts the highest volume of Thai investment in the region. To raise awareness among Thai general publics, the Royal Thai Embassy in Maputo opened a new Facebook page dubbed, “Hoyo Hoyo Mozambique,” which translates as “Welcome to Mozambique.” This page has become the focal communication channel bridging Maputo to Bangkok. The second component of integrated public diplomacy concerns a country’s brand or reputation. 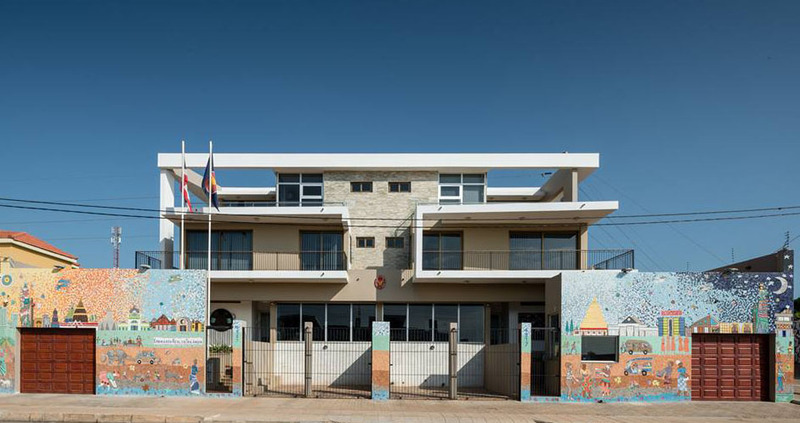 This section investigates how the Royal Thai Embassy in Maputo generates Thailand’s national image among Mozambicans. To enhance the Thai brand as “a friendly and approachable country," the embassy underlined the utilization of art and music as a bridge between people of the two countries. A pertinent instance of this is the decoration of the embassy building. Instead of installing the usual gold plate or solemn stone sheet, the embassy favored mosaic art, which is popular in Mozambique. The artists were requested to portray the warm relationship between the two countries and their perception of Thailand. Therefore, some of the artists drew Tuk Tuk (a Thai style three-wheeled vehicle) and Thai monks. Music also plays a crucial role in branding Thailand. The embassy summoned the performers of Pong Lang (a Northeastern style of Thai musical performance) to Mozambique. Interestingly, Mozambique is likely to utilize the same pattern of fast-pace rhythm as the Northeastern region of Thailand. Recently, the Thai national sport of boxing has been pioneered on Mozambican soil. On February 13, a group of master boxers visited Gaza Province to present traditional Thai boxing to teachers and students. There were more than 900 spectators attending the performance and cheering on the performers. To pursue SEP at an international level, Thailand has adapted the principle of SEP to the United Nations’ Sustainable Development Goals (SDGs), particularly those related to food security, climate change, public health and building partnerships. Thailand’s public diplomacy programs in Mozambique have been formulated from its determined strategies and existing diplomatic and cultural resources. A concrete example of its implementation in Mozambique is Thailand’s foundation of a demonstration center of tilapia farming. This program shared indispensable knowledge about the proper handling of tilapia to local farmers. Some farmers were selected to learn more about advanced techniques in Thailand. Meanwhile, the Thailand International Cooperation Agency (TICA) supported a special visit of Thai experts to witness the progress on-site and to offer some useful advice. In addition to teaching local people how to feed tilapia, TICA invited a Thai chef to demonstrate how to cook a new tilapia dish. The participants reflected positive feedback. One participant requested an additional training on how to cook tilapia. There are two findings in this analysis. First, Thailand’s public diplomacy programs in Mozambique have been formulated from its determined strategies and existing diplomatic and cultural resources. Second, these programs are positioned by both short-term and long-term objectives depending on how the policymakers set the agenda. To sum, Golan’s integrated public diplomacy is useful to interpret a single country’s public diplomacy toward its target. However, it is not always the case that the first layer, which focuses on effective communication, is a prerequisite condition to the successful implementation of branding and relationship management.